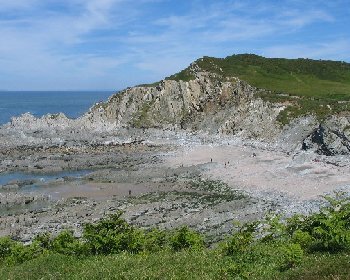 Rockham Beach is a small sand and pebble beach with rock pools, a few miles north of Woolacombe on the North Devon coast. There are no facilities. The nearest parking is at the village of Mortehoe which is about a 30 minutes walk. Update April 2016 - after a landslip, new steps have been built to the beach and the beach is now open. Mortehoe is close to Ilfracombe which is 45 miles from Bude and 52 miles from Exeter. There are various routes into North Devon. From North Cornwall take the A39 (North Atlantic Highway) past Bude and into North Devon towards Barnstaple. Approaching Barnstaple at the Lake Roundabout turn left onto the A361 (signposted to Ilfracombe). Alternatively from Exeter take the A377 and approaching Barnstaple at the Bishops Tawton roundabout turn west onto the A361 and continue on the A361 until Lake Roundabout and turn right to continue on the A361 (signposted to Ilfracombe). Follow the A361 over the new road bridge over the River Taw and then at the Braunton Road Junction turn left for Ilfracombe. Continue on the A361 through Braunton towards Ilfracombe. Then at the Mullacott Cross roundabout turn left onto the B3343 signposted to Woolacombe. Follow the B3343 for about a mile and then turn right onto Mortehoe Station Road (signposted to Mortehoe). Follow this road to Morthoe and park in the village. There is a footpath to Rockham Beach (signposted to Rockham Beach). Alternatively park at Woolacombe and walk the coast path north, taking at least 1 hour. 1 small car park in Morthoe village. Also car parking at North Morte Farm Caravan and Camping Park to the north of the village. No toilets at the beach. Nearest toilets in Mortehoe village.